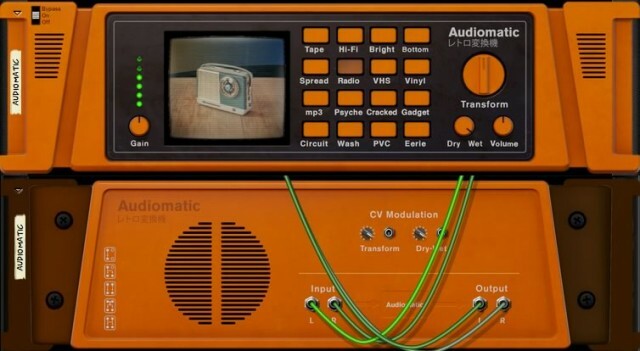 Propellerhead’s latest cheeky tutorial makes no apologies. Reason 7’s Audiomatic Retro Transformer is, they say, the equivalent of tapping a filter on a phone camera app like Instagram, bundling lots of different sound attributes together into a single push-button setting. This seems likely to produce some controversy. In fact, I’d for some time pondered writing an editorial decrying the Instagram Music phenomenon – digital music covered in layers of crackly fuzz for no terribly good reason, uncreative cynicism and artificial nostalgia posing as authenticity. But let me for a moment play devil’s advocate … with the voices in my own head. Maybe I never wrote that editorial partly because I found the effect fascinating myself. I started actually using Instagram and loved it as an experience that was entirely unlike the experience of using film. With similar effects in music, I had an equivalent feeling: this was a digital experience that was independent from the hardware these effects mimic. So maybe there’s something else going on here. As this tutorial point out with Instagram, it’s natural for an end user to think about end results rather than the many individual components that might get there. It’s also easier to get the brain to try A/B comparisons of groups of settings than to try to parse even more choices one parameter at a time, especially when those parameters interact. That’s true whether you’re a newbie or a pro. In other words, presets may play to our perceptions. They group together related attributes we already find pleasing (the look cross-processed 35 mm film or the sound of a cassette tape). But just as importantly, they allow us to compare results rather than get mired in individual details. 1. Use them on unexpected content. The best Instagram photos don’t obviously use certain filters; they might produce surprising results or simply fit the content so well that your focus is on the photo. 3. Use turning these filters on as a way to turn them off. Because they’re easy to A/B, I find one of the best upshots of habit-forming presets is then forcing yourself to walk away from those habit-forming presets. It seems there are often times in which you spend lots of time turning on filters (images or sound) only to make your last step removing them again. Sometimes, in that final instant, you appreciate the value of the original without the filter. These can become valuable by their absence. There’s also to be said about why this stuff is suddenly becoming desirable now. Long-time Reason guru Marco Raaphorst weighs in on the new feature, and he reflects on why everything old is good again. What sounded wrong in the past sounds perfectly normal today. Many years ago I disliked tape-noise, hum, overdrive but somehow I started to appreciatie it when I became more aware of the pros and cons of digital sound. That dirt is suddenly more popular now because, beneath it, you can retain the original. (Hence, my reflection on the ability to switch it all off again and see the difference.) VHS tape editing, I recall, was especially excruciating: as you edited on VHS, you would watch your footage slowly look worse with each edit, the decks gradually scraping the magnetic particles off the film. Dynamic and ribbon mics are nowadays sometimes a better choice for recording than ever before since they offer that natural high frequency roll-off. It was harder to see that value when you didn’t have a choice. Now that you do, you begin to see why this “bug” might be a feature. With digital effects after the recording, you have a lot of power over how you apply the effect – whether subtle or extreme, a little or 100% wet. Marco says he’s been experimenting with all those things. I’ve had a similar experience with some of the Universal Audio effects – and sometimes, switching them off becomes the creative breakthrough. It’s wonderful having this stuff in your arsenal, and the Reason effects are very different in character – enough that this is another reason to fire up Reason. Now I just hope Facebook doesn’t buy Propellerhead and SoundCloud to make Tuneagram.